Things as ideas and spaces, a photo by timtak on Flickr. Chomsky argues, convincingly to me, that to an alien from outer space, human language would appear to be dialects of the same single Earth language such is the similarity between the various national languages of the world. While the word order of Japanese and English are so different, often back to front, the two languages have many similarities. The difficult part about learning Japanese was mostly to do with learning to think in a different word order, rather than to learn to think in a different way. The word order changes are difficult enough. What is the NOUN's ADJECTIVE place? E.g. (transliterating) What is this blog's interesting place? I found this expression in Japanese to be very difficult to use. It required not merely a word order shift but a change in conception of things and their attributes. What is a thing? What is an entity? What are the NOUN's ADJECTIVE point? What are the ADJECTIVE parts of this NOUN? But these are rather unnatura, e.g. What is this blog's interesting point? What are the interesting parts of this blog? My students of English use, or attempt to use, the above forms a lot. Perhaps I should encourage them to do so. Nacalianly speaking, I think that these expressions reflect differences in what it is to be an entity. The pronoun "about," such as in, "I am thinking about X" or "This is a story/book about Y" introduces a narrative. The question "What is ADJECTIVE about NOUN," assumes that NOUN is a narratival entity. Things or entities, (e.g. this blog, or a person) are concepts, or narratives. But the Japanese expression, "What is the NOUN's ADJECTIVE place?" 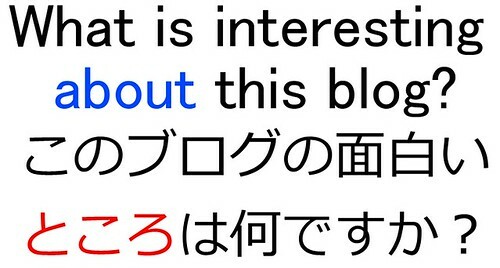 suggests to me that Japanese speakers conceive of entities spatio-visually, as a collection of images. The Japanese question is asking for the image, out of the collection of images that forms that entity, that corresponds to the adjective. The English question is asking for the part of that narratival entity (the part of the narrative) that conforms to the adjective. Japanese conceive of entities (including themselves) as mental scrapbooks of connected images or places, spaces. Westerners conceive of entities (including themselves) as stories, or narratives.